$1.99 to $132.99 & FREE Shipping on orders over $59 $35. Time to change lines and like the antimicrobial benefit. Sounds like a great lone to use in my kegerator. The cost and time of making great beer more than justifies getting good lines which don't taint all the effort. Worth the extra money, trust me. Want to upgrade my kegerator. I'm not pulling from the keg more than a couple times per night so I hope less flavors will be picked up from the line. 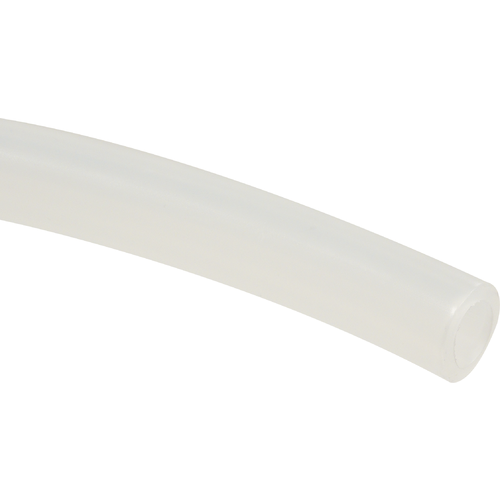 More flexible then traditional vinyl tubing. What is the OD of this hose? Thanks! Just got my tubing installed in a new keezer with the intertap flow control faucets. I'm having a lot of foaming issues and I can't dial my system in. The lines are all ten feet. I've tried low pressure at 5psi and high pressure at 20psi. Nothing seems to work. Any ideas? 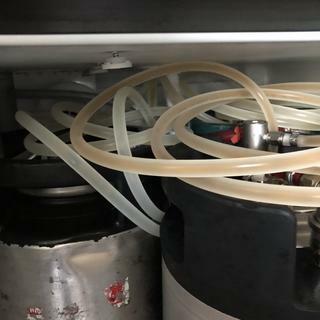 BEST ANSWER: Hi Jason - Referencing this website: https://support.edgestar.com/hc/en-us/articles/115005299643-Why-do-I-get-foamy-beer-from-my-Kegerator- if none of the information is helpful please email us directly at info@moreflavor.com or call us at 1-800-600-0033. Does it leach the silver into the beer over the 528.34 gals of it's antimicrobial life? After the first 528 gallons should the line be replaced? 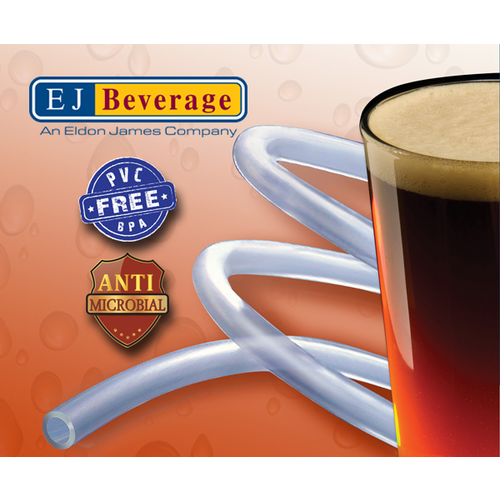 BEST ANSWER: Hello Jason - TUB400 offers extremely low leachables, after the 2000 liters of beer, it's likely the antimicrobial begins to degrade. Replacement is up to the consumer and preventative maintenance practices. I have read that the beer line calculators aren't accurate with this. I have 6' lines on my kegerator now at 14psi and 38°F. I still have foaming issues. I read you have to double what the calculators say with this line? Is this true? BEST ANSWER: For such a short draw, sometimes calculators can be inaccurate. Better suited for 20+ feet. Try lowering to a serving pressure below 10psi. When I read how this was tested in Germany in the product description, I thought, why not? No magic to installing beer lines. No magic in a great beer taste if you clean your lines periodically and replace on occasion. Mmmmm beeeer. I just finished replacing my old plastic beer lines with this hose. What I found is that you need to be very careful when heating the hose. My old hose needed to be placed in boiling water for 30 seconds before it would stretch over the beer shank. With this hose , after 30 seconds the hose got so soft it almost melted and I had to cut it off and start again. Just a few seconds seems to be enough to allow the hose to stretch over the shank. Other then the above, the hose so far seems great. I'll know more after I have passed a few kegs through it. you can tell this is better than the old stuff. Replaced old stained tubing with this a while ago. I'm always meticulous about cleaning and sanitizing the lines before and after every keg however stains are inevitable... or so we thought. Stays clean a lot longer than the clear plastic hose I was using before. Worth the added expense as it lasts longer. It's a bit stiffer, so have some boiling water handy to soften the ends when attaching fittings. Excellent tubing, flexible, good pours. Look out for bumps in the line, had to cut those sections out. I'm not a chemist or a science geek in any way. The write up made sense, I needed beer line, and the price difference was minimal. Very good! Installed it in my 5th wheel toy hauler, making it my rolling tap house. So far so good. Stays very flexible inside my kegerator. Very easy to work with. This is definitely an upgrade for your kegerator and the second time I have installed these lines on my kegerator. Keg King should make them an upgrade option over the pex lines that cone with it. The tubing is pretty good. I had some trouble initially getting it on a piece of equipment. I heated it in hot water and still had some trouble so I went to a smaller diameter piece and it worked fine. If the tubing gets squeezed in some way it will hold this shape sometimes for some reason. Just beware of this when you’re attaching it to a shank.